Leaving a 3D printer unattended is not very smart, especially a homemade one. If you’re lucky, you’ll only mess up a print and waste some plastic. If you’re less lucky, you can cause some damage to the printer or worse, burn down your house! an example of a house fire caused by a malfunction in the temperature control. This is where OctoPrint comes in. OctoPrint is a free 3D printer web interface. It includes a password protected interface with live video stream, time-lapse capturing, G-Code viewer, Terminal interface, Temperature graphs, motor and temperature control buttons, and more. This means you can SEE what is going on in real-time and stop the printing or send some code to the printer if necessary. This is a huge convenience, I no longer have to go and check that everything is OK, I can do it from my phone. Moreover, I can slice on any computer and send the G-Code from anywhere in the world. If I don’t have a computer with slicing software, I can even link OctoPrint to a local installation of CURA and slice remotely! now that’s amazing. I work with two computers, a desktop and a laptop. Although OctoPrint gives me the freedom to send and monitor prints from any computer, I didn’t like the idea that my printer has to be permanently connected to one of them. I wanted the printer to be independent, autonomous. I didn’t want to have to leave my computer on or not be able to reset it is something else needed it. A dedicated computer is a massive overkill, It takes up a lot of space and it costs too much for what it does, I was looking for a more mobile solution so that I could move the printer and still have all features available. I wanted the printer to be an all-in-one solution. After a short search I found OctoPi, A Raspberry Pi image with OctoPrint and everything built-in, maintained by Guy Sheffer. This means I can mount a RPi on the printer and have the interface and all of its features and settings no matter where the printer is set or on which computer I’m currently working. OctoPi also provides a GUI for a touch screen to be mounted on the printer, I have no need for this right now, but maybe I’ll add one in the future. 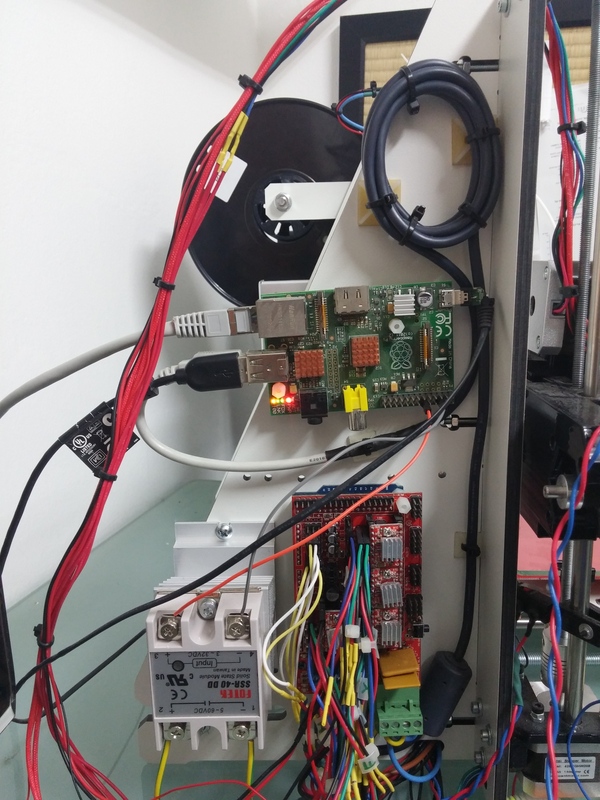 Raspberry Pi mounted on the printer. Excuse the cabling – i’m still working on that. If you’ll notice, the USB cable is made of two cables, there are two reasons for this. One, the Arduino’s USB port is facing downwards and a straight jack would be pressed against the desk and apply force on the Arduino – not good. I used some scrap L shaped USB-B cable I had from an old scanner to prevent this. And two, the RPi and the Arduino are powered via two different power sources and both regulate the voltage seperately. This means that their operating voltages aren’t 100% identical. If I connect the RPi to the Arduino via regular USB cable, the RPi would supply its regulated 5V to the Arduino, making the Arduino receive power from two different sources – also not good. For this reason I cut the 5V line of the USB cable, thus connecting the + and – data lines and sharing ground (important!) without supplying power. I didn’t cut the cable to length because I’m not completely sure this is the final position of all components. there are more to be mounted.